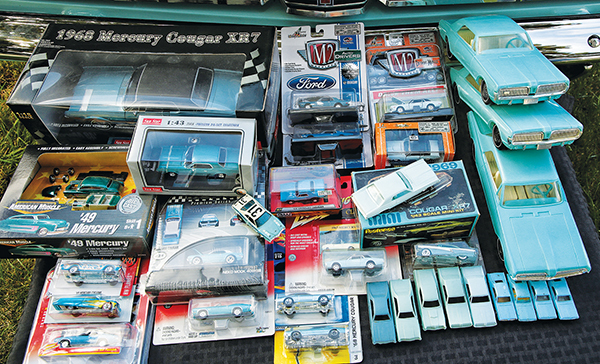 Light Aqua Mercury cars are the inspiration for this issue’s collectibles article. By no means is this a complete list; however, Mark and Rob teamed up to share some of their favorite Mercury miniatures in Light Aqua/Blue (related colors are discussed as well). The focus will be on diecasts and plastics. Not shown are AMT 1/25 promos, due to the quantities of year and model. There are plenty of paper products, as well, including original dealership brochures, post card promotions, Papercraft folding model kits, magazine ads and posters. Mark provides us a glimpse of his numerous years of collecting Mercury diecasts and plastics. “From the start, I have been in a Ford family,” he said. “My dad and his two brothers always had cars and trucks from FoMoCo. One of my uncles collected Model A’s and Model T’s, but his pride and joy was a 1953 Mercury. “My other uncle was a master mechanic, owned his own Gulf service station and had two stock cars that he built and drove at the local race track (1949 Ford bodies). My dad and mom had station wagons, mostly (the 1964 County Sedan sticks out in my mind), except for the 1957 Fairlane coupe and the 1965 Mustang coupe (which was my mom’s car). My mom’s sister had a 1961 Comet that I loved – can’t beat those fins. “My very first (real) car was a high school graduation gift from my parents. It was 1975 and the gift was a 1963 Comet. It was an automatic, beige with a white top, four-door. I loved that car and those little fins. Mark was devastated. He didn’t start collecting again till he was out on his own. It is tough, as not all diecast come in those colors, but the search was on. Mark collects all scales (1:87, 1:64, 1:43, 1:32, 1:25 and 1:18). He has diecast, as well as plastic promo cars and models. 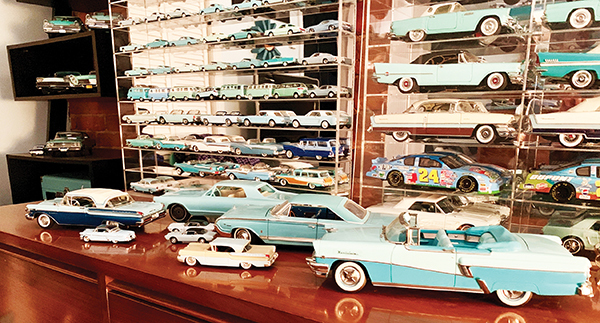 Picking favorites from all of Mark’ s Mercurys is difficult, but he loves the afore mentioned 1:24 1957 Montclair, the 1:87 1960 Comet, the 1:18 1964 Marauder, the plastic 1967 1:18 Cougar promo and the 1:18 1956 Montclair convertible. Rob May’s Cougar background pairs up well with Mark’s collection. In 1986, Gary May bought Rob his first car – a 1969 Cougar in Light Aqua (E color code). This car has been featured in a previous Quicksilver magazine, along with several examples of collectibles from the May museum (a 40-plus year collection). 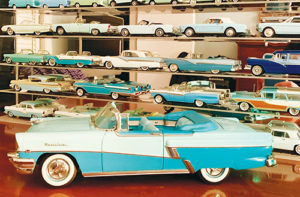 Manufacturers of Light Blue Mercury items in this museum include, but are not limited to, the following: Marx, Hot Wheels, Matchbox, Autoworld, Johnny Lightning, M2 and AMT models. The plastic promo cars (both the 1/18th scale Gay Toys Inc and 1/64th F&F/JVZ cereal cars) have been highlighted in prior issues, as well. While there is a wide variety of blue Mercury Hot Wheels Cougars, a rather unique item is the Japanese “Sweet Rods” premium series 1968 Cougar. In addition to Cougars, Hot Wheels offers numerous Mercury cars. Examples include: from the 2011 Boulevard series – 1956 Mercury, ’69 Cyclone and Classics’ ’49 Mercury. Johnny Lightning follows the same footsteps as Hot Wheels, with both Cougars and other Mercury 1/64th diecasts such as the 1971 Montego. 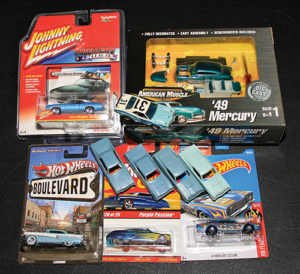 Blue Mercury slot cars are also found. Not to be missed is the 1/64th scale AFX Mercury Stock Car and Cougar Thunderjets. Vintage items besides the promos, Cougars can also be found in light blue. Marx “Mini Blazers Bulldog” is the smallest. Not to be missed is the 1/64th scale AFX Mercury Stock Car for slot-car racing. AMT produced a 1/43rd scale “Mini” model of the 1969 Cougar that is molded in Light Aqua, matching Rob May’s Cat! (A similar AMT “mini” was produced for the first-generation Cats). While the same color paint may be found on a particular year Ford/Lincoln/Mercury, the name of the paint varied. In addition, each year offered a chance to change the name or the shade of the paint. This article highlighted Light Aqua/Blue Mercury collectibles. Clearly, other shades of aqua/blue Mercury items are available as well. 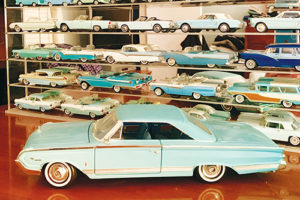 “Aqua” examples include Hot Wheels ’69 Mercury Cyclone, Hot Wheels Classics series – Purple Passion (’49 Mercury) and Ertl’s, owned by Racing Champions at the time (2001), American Muscle series ’49 Mercury. Diecasts, plastic promos and paper products can all be added to your blue Mercury collection!